It’s no secret that the biggest challenge facing digital marketers today is measuring how effective their marketing strategies is. While the role of digital marketing in an enterprise can’t be overemphasized, it’s important to evaluate the effectiveness of a marketing campaign. If you’re reading this blog, I’m certain that you may be confused between going out for web analytics or marketing analytics. Before you begin evaluating the effectiveness of your marketing campaign it’s vital to distinguish between web and marketing analytics. So, what’s the difference? Well, web analytics—what’s commonly known as Google analytics—measures web metrics such as traffic, the bounce rate, page load times and unique visitors. It provides you with insights on how prospects use your website, how they get there, and measures that you can take to make them visit again. Besides, web analytics can also inform you which areas of your website are performing well, and what you can do to improve them. These measures are important for search rankings. If you want your website to rank higher on Google (and any search engine) then you must ensure that your website is not only responsive but also secure. Marketing analytics deals with measuring metrics such as visitor traffic, the number of leads, and sales that come about as a result of a digital marketing campaign. Put simply, marketing analytics are people driven which features the prospects, leads, and customers while web analytics deals with the responsiveness of the website. That’s a tough question. However, both analytics are essential for your website. Your website or blog won’t promote your bottom line if there are no visitors or prospects. Therefore, the first strategy that you should craft is search engine optimization. Measuring the readiness of your website with regard to search engine optimization is what web analytics is about. On the other hand, you want to know how many prospects have visited your website and how many have converted to leads and customers. This is a critical component for measuring the success of your marketing campaign. Truth be told—majority of marketers have concentrated on web analytics as opposed to marketing analytics. Here’s a fact, even if you spend so many hours going through the data using Google analytic tools, you’ll never comprehend the success of your marketing efforts unless you embrace marketing analytics. If you’re looking out for a solid analytic system that can help you integrate several channels, then look no further than HubSpot’s marketing analytics. With HubSpot’s marketing analytic tools, you’ll be in a position to determine how each individual channel—such as social media, email marketing, and blogging—are performing. If you want to find out which channel is generating more leads, then the HubSpot’s marketing analytics tools will give you that report. While web analytics focusses on page view reports to determine the responsiveness of the website, marketing analytics is people-focused. If you’re interested in knowing how a particular prospect came to find out about your website, then HubSpot’s marketing analytics can tell you all this and much more. As a matter of fact, marketing analytics provides you with very powerful intelligence to grow your business. Your website may be efficient in lead generation. But the question is …are the leads converting to customers and making money for your business? HubSpot marketing analytics can help you tell whether the leads are converting into customers or not if you integrate it with other sales channels. Knowing whether your individual marketing campaign initiatives are contributing to the bottom line is a surefire way of finding which channels you should focus on. If you find out that your blog is the one which is effective or social media, then you’ll be in a position to craft strategies that optimize such a channel. 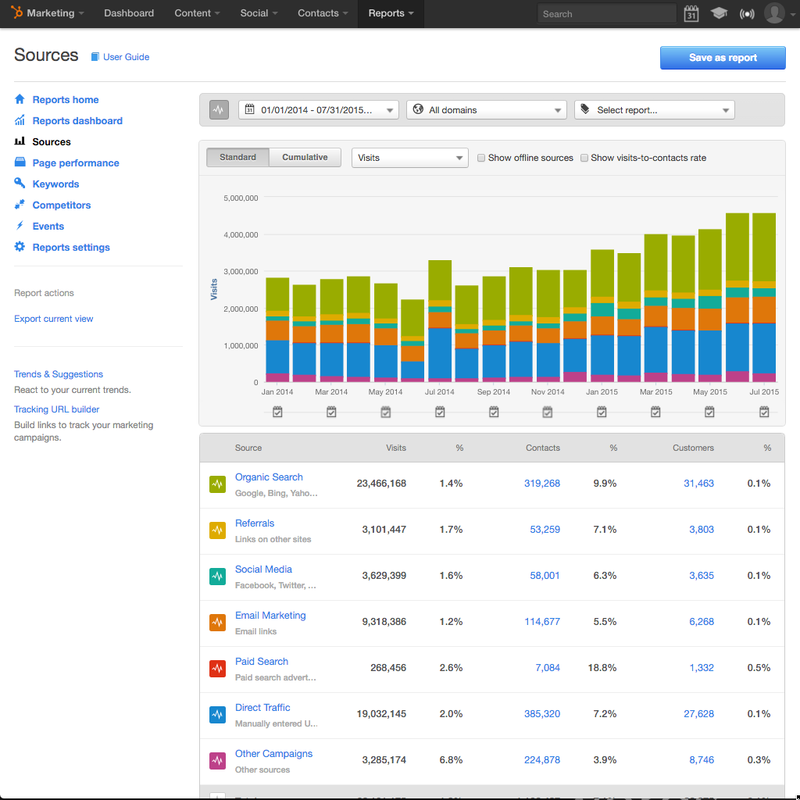 HubSpot’s COS marketing analytic tool provides superior lead tracking when compared to Google analytics. This is because a marketer can differentiate the traffic sources by segmenting them into locations where they are coming from and their convenient geographical times for accessing the content. This is essential in helping to further understand buyer persona profiles. As a matter of fact, you can even track the activities of your prospects when you the “Contacts” tools using their IP addresses. This makes the HubSpot’s COS a superior tool from conversion rate point of view. Well, there you have it. In a nutshell, your blog needs to not only embrace best practices that enhance its SEO capabilities but also marketing analytics that measures how well prospects are converting to leads and customers. That’s why HubSpot’s marketing analytics is essential for your marketing efforts.